With club football now back in full swing, PUMA brings some added excitement to the pitch with the latest evoSPEED SL colourway . The electric blue lemonade, white and orange clown fish coloured boots are made for players that like to stand out through their fast style of play. PUMA evoSPEED players not wearing the new blue and orange Head to Head Duality boots, will move into the new boots today. All other players will wear the duality boot for one more game before going into the new colourway from October 5. The evoSPEED SL is PUMA’s lightest football boot to date, designed to give footballers a new game advantage by enhancing speed and agility. The radical weight reduction was largely accomplished through the use of a super light, almost translucent textile upper material. Whilst ensuring the necessary stability, the low weight PUMA SPEEDFRAME adds to the overall lightweight theme of the evoSPEED SL. Further support is given through a minimalistic heel counter, which also provides the foot with a snug fit. The traction studs support the players’ forward acceleration and enable better ground penetration. Combined with the five conical studs that are placed in the forefront and medial back end of the boot, changes if direction and quick turns are radically improved. Marco Verratti commented on the new boots, “I have been playing in the new evoSPEED SL boots for three months, and their low weight still fascinates me every time I put them on. 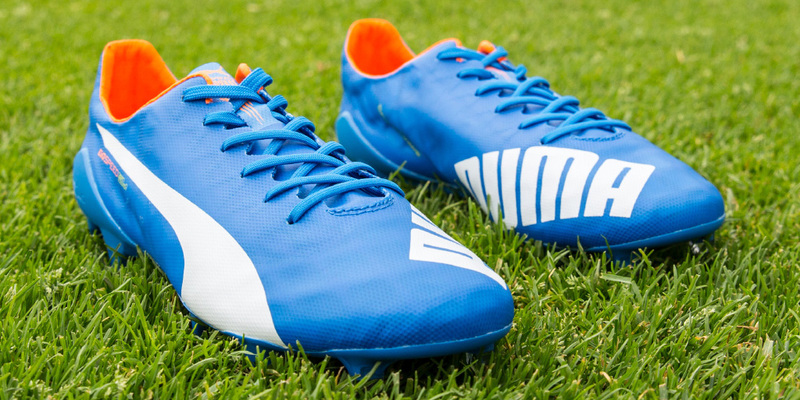 What do you think of the new evoSPEED SL Boot Colourway Launched By PUMA? Let us know in the comments section below or on our Twitter and Facebook pages.